The TerraWave M3045020M3D318 GPS/Cell/PCS/Wifi Omnidirectional Antenna is designed for GPS/Cell/PCS/Wifi applications. Includes four 13' pigtails - one pigtail dedicated to GPS, and three multiband pigtails dedicated to the Cell/PCS/Wifi frequency bands. 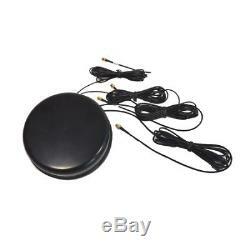 This antenna is an ideal solution for multiple frequency systems and includes a mounting gasket. Make sure all of your auctions have ended prior to checking out. Software that has been opened will NOT be accepted. The item "TerraWave 4 Lead GPS/Cell/PCS/Wifi Omni with SMA & RPSMA Conn" is in sale since Saturday, September 8, 2018.